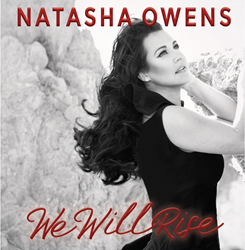 Singer-songwriter Natasha Owens has announced plans to donate all proceeds from the retail sales of her new album, “We Will Rise,” to Hurricane Harvey flood relief efforts. A resident of Texas, Owens will hit the road this fall for a U.S. tour with Carman. Natasha Owens, "We Will Rise"
I’m proud to be a Texan, and even more proud of the way that people are coming together to help others in the wake of the devastation of Hurricane Harvey. Like all Americans, Christian singer-songwriter Natasha Owens has been heartbroken over the ongoing flooding in her home state of Texas following Hurricane Harvey. After much prayer and discussion with her team, she’s decided to donate all proceeds from the retail sales of her new album, “We Will Rise,” through the end of the year. Natasha hits the road in October for a U.S. tour with fellow artist Carman. This comes on the heels of heavy touring throughout 2017, including the “God Is On The Move” Tour with 7eventh Time Down, Audio Adrenaline, Greg Sikes and Austin French, and additional dates with JJ Weeks, John Waller, Plumb and Matthew West. Additional dates are being added, and all dates are subject to change. For updated tour dates or more information, visit the official website at http://www.natashaowensmusic.com.